Six Injured When Pursuit of Suspected Drunken Driver Ends in Crash in Vista. Photo via OnScene.TV. A half-dozen people were injured Wednesday when a pursuit of a suspected drunken driver ended in a crash in Vista, authorities said. The crash occurred shortly after 2:20 a.m. on East Vista Way near state Route 76, California Highway Patrol Officer Mark Latulippe said. The driver of a Nissan Sentra was observed speeding and following other cars too closely on East Vista Way, with the sedan’s high beams on, and took off when a CHP officer attempted to make a traffic stop, Latulippe said. Less than a mile into the pursuit, the car went through a red light and struck a westbound Hyundai Sonata and Toyota Corolla at the intersection of East Vista Way and SR-76, he said. 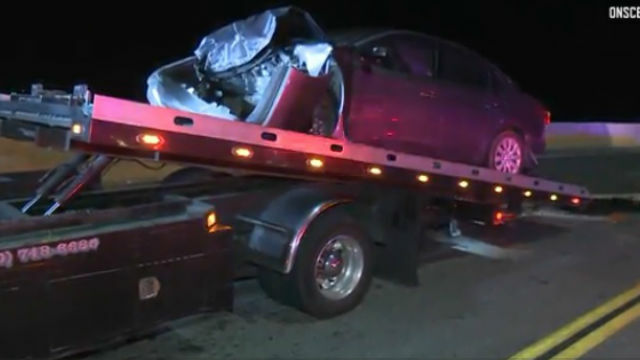 The Nissan’s driver, 20-year-old Christian Avila-Ramos of San Marcos, and a 19-year-old female passenger were transported to Scripps Memorial Hospital La Jolla with major injuries, Latulippe said. A 65-year-old man driving the Hyundai and another 19-year-old woman in the Nissan were transported to Palomar Medical Center with minor to moderate injuries, he said. Two other passengers in the Nissan, a 19-year-old man and an 18-year- old man, sustained minor injuries and declined medical transport, Latulippe said. The driver and a passenger in the Toyota were uninjured. Avila-Ramos was expected to be booked into county jail on suspicion of felony DUI, felony evading and felony evading causing injury after being medically cleared, Latulippe said.